Germans are known to produce high-quality products. It’s no different when it comes to Sennheiser and their microphones. With almost 70 years of experience in producing sound equipment, they offer a wide variety of microphones that feel great in use and offer a very satisfactory experience. This time I am going to compare two microphones from Sennheiser – e835 and e935. Check out if e835 is enough for you, or should you buy more expensive e935. There isn’t much difference between these two mics when it comes to design and build quality. Both microphones are made of metal and offer a 10-year warranty, so you know that you can expect a very high quality. They are designed for musicians who require a thought mic that can take a good beating in harsh weather conditions and still work flawlessly. The biggest difference between these two mics when it comes to design is size and weight. The e835 microphone is a bit larger in size, but lighter than e935. These microphones have a humbucking coil that reduces electromagnetic interference and shock mount system reducing noise arising from handling. They connect via a standard XLR cable. Sennheiser doesn’t include this cable, so you have to buy it separately. e835 and e935 are cardioid microphones. This type of pattern helps with isolation on stage and to minimize unwanted noise. Both microphones are able to handle high sound pressure levels and they are also effective at rejecting feedback. However, on loud stages, e835 may produce a constant feedback and the upper midrange can become a bit harsh. On the low end, it’s very balanced and it’s excellent at handling speech. The first thing that you will notice in both mics is that they are great at natural voice reproduction. The sound coming from these mics will be as close to your natural voice as possible. While comparable in build quality, you have to remember that e835 is a budget microphone, so Sennheiser has to make some compromises. The first noticeable difference between these two microphones is that e835 pics up more stage noise and doesn’t sound as good as e935. e935 produce a warm and bright sound with better clarity. It sounds rather smooth, still offering a good transient response. e835 is generally designed for live stages, but you can also use it to record vocals, guitar, or even drums. Sennheiser e935 is a very versatile microphone – it has the sweet spot, it can work for almost everybody. Doesn’t matter whether you are a tenor, baritone or a high-pitched female singer. e935 can work on peaceful parties, karaoke, and jazz clubs, but also moderately loud stages. Especially if you are a lead singer and don’t have to worry about the bleed. PROS: Very attractive price / Natural sound / Excellent for speech / Very balanced low end / shock- mount / Durable. PROS: Attractive price / Smooth and natural sound / Nice amount of detail / Resistant to feedback / Durable. CONS: Transient response could be better / Upper midrange gets harsh / Not as versatile as e935. CONS: None. 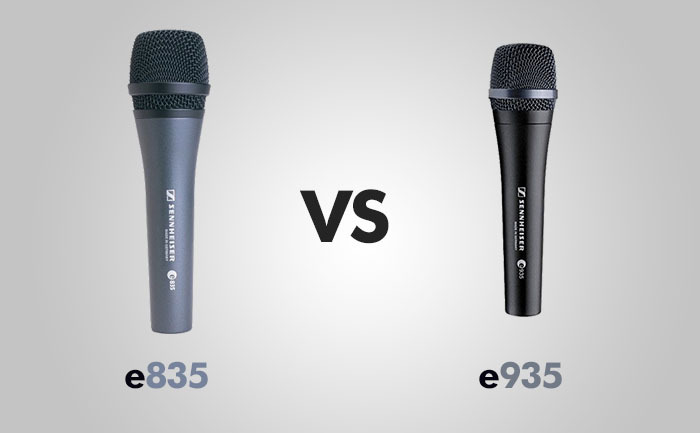 While e835 is a good microphone, e935 is better in multiple areas, making e835 users gravitate towards e935. I think that even if you are on the budget, the more expensive option is still quite affordable and more future-proof.